As with most travelers, I like to peruse travel brochures before departing on any journey. On a fiber arts journey that means books and magazines with lots of wonderful projects. I do have to admit I spend too much time looking at wonderful things to make. Sometimes it is so much fun to plan projects even if they never materialize. So on this blog I will be sharing many yarn journey brochures of fabulous adventures. One of my favorite books is pictured below. I have studied the directions for the tunic motif and would some day love to use it as an embellishment. The cord is sewn in one continuous piece producing such an intricate design. This book published in 2002 by author Mary S. Parker is full of embellishment techniques from around the world. It also has patterns and directions for cutting and sewing the clothing. There are lots of picture postcards of long ago days and exotic places from the author’s collection. 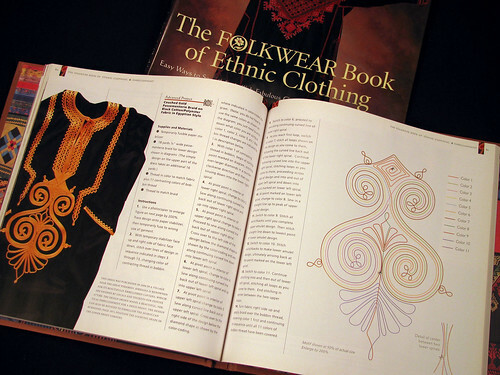 I would recommend this book to anyone interested in ethnic clothing. It covers so many types of surface decoration it is hard to list all of them. I will do that in future posts one by one to explore them more thoroughly. This entry was posted on Tuesday, December 2nd, 2008 at 3:00 am and is filed under Sewing. Tagged: Clothing. You can feed this entry. You can leave a response, or trackback from your own site.